Glossop North End know too much how a cup defeat feels as recent to 2009 when they lost to Whitney Bay – Neighbours to North Shields. Glossop manager Chris Willcock, called this a huge “disappointment”, he said, “We don’t like losing any football match, after the magnificent season we (Glossop) have had, we would have liked to cap it off with a win today, but it was just a bridge to far after a real long season. The first half was a fixed affair, no real gasps and no real conviction was shown from either side. North shields took their time to get settled, with the clubs first experience at Wembley. A nervous start was imminent. The best chance of the half fell to Glossop’s Sam Hare, but his header was dealt with comfortably by goalkeeper Christopher Bannon. On the brink of half time, Bannon once again, made a fine save. It was Kieran Lugsden this time, he drilled a shot into Bannon who dived to his knees quickly and effectively stopping the shot. North Shields came out the blocks in the second half, and certainly put goalkeeper Greg Hall under a lot of pressure. There was also a big scare for Glossop as Ben Richardson struck the bar following a string of attacks. Another great attempt came from Michel McKeown. He won possession and set Dean Holmes down the left hand side, but before McKeown could adjust his positioning, he received the ball back forcing a save out of Hall. Shortly after the Shields pressure, Tom Bailey prodded Glossop North End ahead after North shields failed to clear a corner. The ball fell to Kieran Lugsden and he fizzed a ball across goal to Tom Bailey who poked home the first goal of the match. However, Gareth Bainbridge pulled North Shields level after scoring from a corner. The ball flew into the front post and Bainbridge headed into the back of net. The Tyneside were firmly back in the game and their fans let everybody know about it as they lit up the stadium with a huge roar. The equalising goal was enough to take the game into extra time, where substitute Adam Forster scored the eventual winner. Seven minutes into the extra time period. Man of the match Denvor Morris darted past Matthew Russell and delivered a brilliant low cross for substitution Forster, as he arrived unmarked at the back post, placing the ball into the right hand corner, putting the Shields into the lead for the first time in the match. Despite Glossop having a number of chances, North Shields kept strong and pulled through to win. 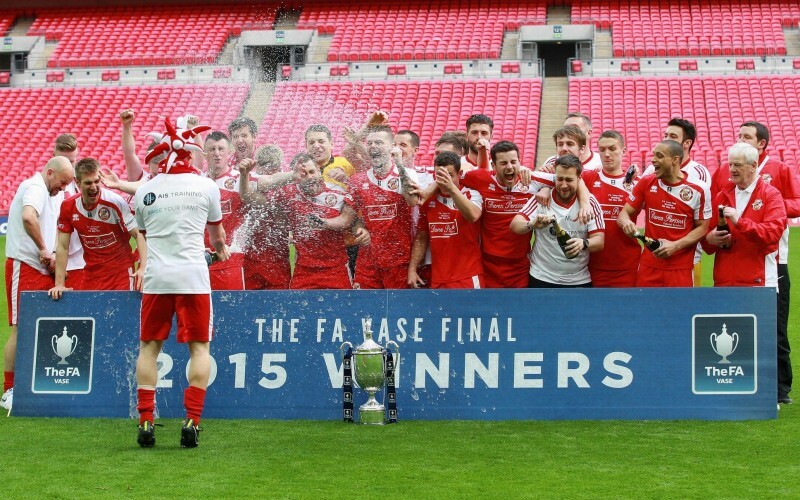 They were finally crowed the FA Vase 2015 winners and also wrote themselves in the history books, becoming the only club to win the old FA Amateurs cup (Old FA Vase) and the FA Vase. Substitutes: 12 Daniel White on for Moran, 61; 16 Samuel Grimshaw on for Blackshaw, 69; 15 Samuel Hind on for Hare, 82. Substitutes: 20 Ryan Carr on for Luccock, 59; 14 Adam Forster on for Holmes, 69; 8 Kieran Wrightson on for Bainbridge 106.